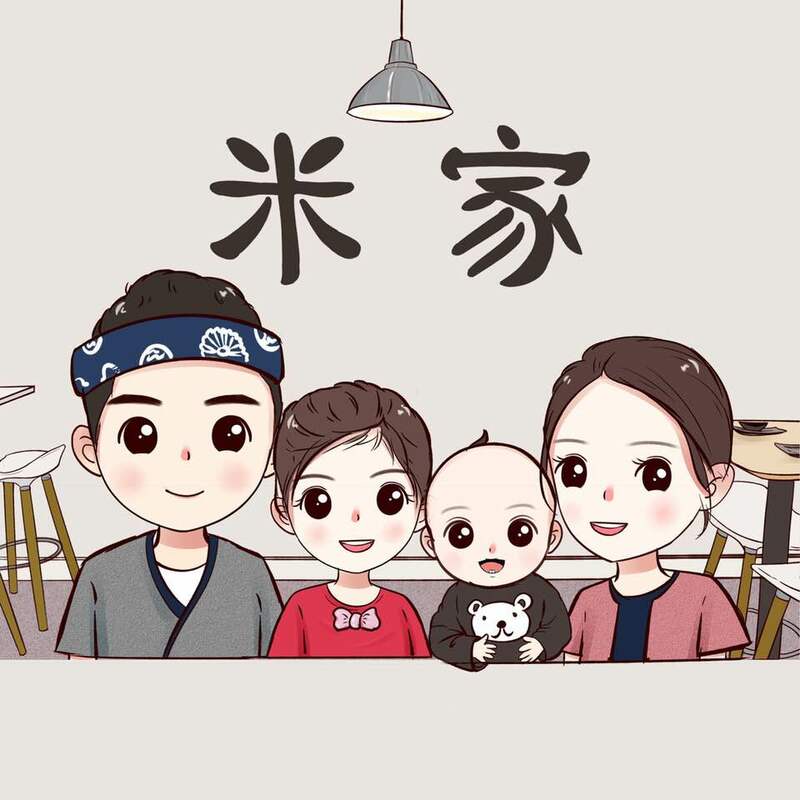 Liang's family cartoon photo made by their friend named "Bai Yang". (From the left, Eddy Liang, Maggie Liang. From the right, Shanshan Xu, Liang's spouse) The little boy next to Xu, Roger Liang, Liang's son who "came" before the restaurant was open. The abbreviation MI commonly represents Michigan, but a family in East Lansing gave the symbol another meaning as Mi Sushi & Noodles restaurant was born. Mi Sushi & Noodles (Mi) is a family-owned, Japanese-style restaurant located at 3340 E. Lake Lansing Road. It’s operated by Eddy Liang and his family and serves mainly sushi and noodles. Liang used to work in Jackson, which was an hour away from his East Lansing home. During snowy days, he said his family would get worried. Thus, he got the idea to open Mi and to make it close by. In Chinese, “mi” means “rice,” and sushi is made of rice. Liang has worked in the Japanese cuisine industry for more than 10 years. This time, however, instead of just being the store owner, he is also the chef and serves in the sushi bar. 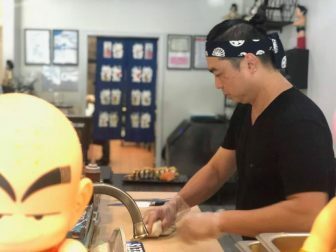 Eddy Liang is working at the sushi bar in Mi. Eddy Liang said he did a lot of research before he started the business. “I went to Las Vegas and Texas to try different sushi to create my own menu,” he said. Mitchell Pilton became Mi’s customer since its grand opening Nov. 17. He lives near Mi and usually orders sushi and beef or chicken teriyaki. The restaurant also has a helper in the form of Maggie Liang, the owner’s daughter. 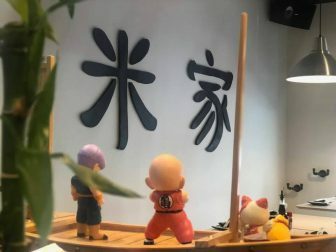 “Here is another connection we think is interesting between the restaurant’s name and what we offer,” said Shanshan Xu, Liang’s spouse. Pilton dropped in the store Aug. 9 for carrying out. He asked for Maggie Liang after he ordered. Pilton said one day he was sitting in the store and waiting for some food. Maggie was sitting in a chair apart from him. “And the owners are nice too, that makes you want to come back,” Pilton said. Mi’s Chinese name was made as a decoration on the wall. Xu is good at making noodles such as ramen and udon. Everything in the ramen except the noodles itself is homemade. Additionally, a special recipe named Guilin rice noodle is also offered in the store. Guilin is located in the northeastern of Guangxi, a city of China known for its scenic hills and rivers. Guilin rice noodle is a classic snack of Guangxi, where Xu is from. She decided to bring her hometown’s taste to the restaurant. “The rice noodle and meat are chewy,” said Hao Fu, a Chinese international student who graduated from MSU this spring. Fu had his first visit at Mi July 20 and said the Guilin rice noodle tastes delicious. “The sesame oil at the bottom of the soup is very fragrant,” he said. After Xu signed the contract for Mi’s location, she surprisingly found out she was pregnant, and a consideration came up: Did they want to put off the business? Xu planned to cook the noodles and set up the kitchen. However, since she was pregnant, Tamy Liang, Xu’s sister-in-law, decided to take over Xu’s job. Her support helps the business to continue. Tamy Liang started her own business in China in 2017. She stopped it and came back to East Lansing and plans to resume her business in November. Xu said the store finally was able to open because the family sticks together. “I don’t know how many challenges I would face if there is no family support,” she said. 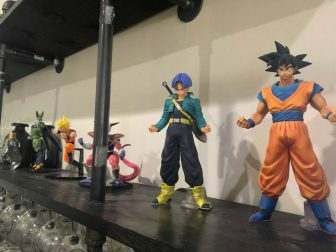 Eddy Liang’s collections are exhibited in the store. The decoration of Mi is modern and exhibits Japanese animation photos and toys. Since the summer vacation, many students go back home. Unlike some restaurants, which decide to close for this period, Mi remained open for the whole summer. Xu’s goal is to increase word of mouth about Mi’s products. She gave an example of ramen. Chris Buck, who became Meridian Township’s economic development director October 2017, was a small business consultant, said he was at Mi’s ribbon cutting, met the owners and went to the grand opening. Buck’s job at this position is to try to get good businesses to come to Meridian Township and occupied empty spaces. Buck said there is an opinion that most of the options in Meridian Township are chains. For example, Subway, Pizza Hut, McDonald’s. Mi is open Mondays through Thursdays from 11:30 a.m. to 9:30 p.m. Fridays through Saturdays from 11:30 a.m. to 10 p.m. It is closed Sundays.